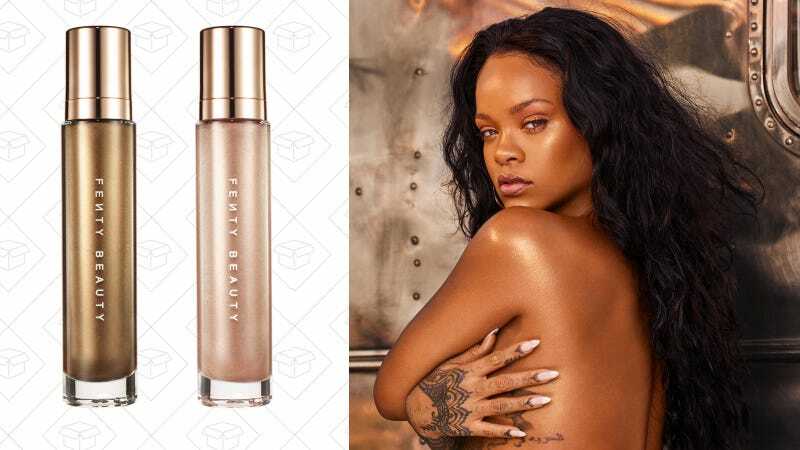 Fenty Beauty Goes Full '90s With New Body Glitter Dubbed "Body Lava"
When Rihanna and Fenty get together, the world awaits with bated breath. Their new body luminizer, Body Lava, is no different. Without giving off 1997 Limited Too vibes (never go full 1997 Limited Too), Body Lava elevates the all-over-glitter product into something you would actually want to shell out $59 for. To be fair, you get a full three fluid ounces in the bottle and this isn’t exactly an every day kinda thing. Unless it is for you. You do you. Part of the Fenty Beauty Beach, Please! collection, Body Lava comes in two shades: Who Needs Clothes?! which is a rose gold, and “lustrous bronze” called Brown Sugar. The new collection also features a face & body kabuki brush, and the Fairy Bomb, a glittery pom pom to be used all over. While the products themselves feel super ‘90s, the packaging is all 2018. Launched today at Sephora.com and on the Fenty Beauty site, the Beach, Please! collection will be the go-to for any kind of shimmering summer look you’re trying to achieve. It’s basically like bringing the beach with you, without getting sand everywhere.